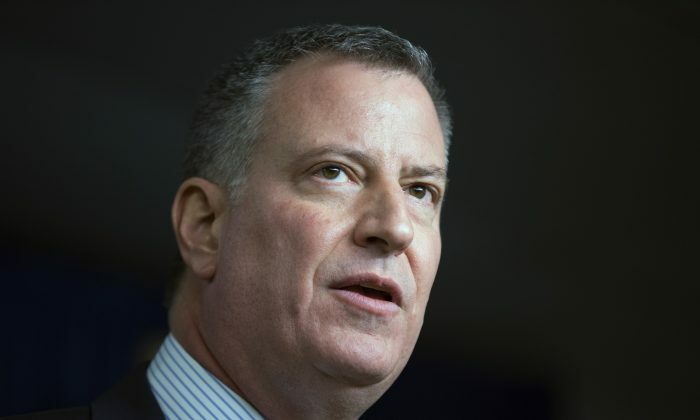 NEW YORK—Mayor Bill de Blasio said it was an emotional moment when he saw that the final state budget proposal included coveted money for universal prekindergarten in New York City. It was a moment of disappointment, however, for the under-dogs of the mayor’s education agenda, the after-school providers. Yet the state budget doesn’t include any dollars for after-school, at least not for the next school year. Both the Assembly and the Senate passed budget resolutions that included the after-school funds, but after negotiations with Gov. Andrew Cuomo, the money disappeared. The mayor’s original plan was to fund pre-K and after-school programs by raising income tax on New Yorkers earning over $500,000, an idea rejected both by the governor and the state Senate. The tax would have yielded some $530 million, with $190 million of that allotted for expanded after-school programs for middle schoolers. The state is instead increasing basic school aid for the city by $233 million, noting in its budget bill the money can be used for after-school. That is not a policy change, since schools could always use the state aid to set up after-school programs, or contract third parties to provide it. Whether, and how much of the money will be used for after-school will be a question decided during city budget negotiations to be decided in June. There is another revenue stream for after-school in the state budget–money from taxing the seven new upstate casinos New Yorkers allowed in a vote in November. The state was to get $200 million in 2015 from selling casino licenses. Most of that, 80 percent, was supposed to fund after-school programs. Another $188 million was to come in 2017, when the state expects its first gambling tax revenues. At the last moment though, the legislators broadened the purpose of this revenue so it can be used for general school aid. The change means there will be no money for after-school, according to Nora Niedzielski-Eichner, executive director of the New York State Afterschool Network (NYSAN). She predicted districts will use the money to offset cuts to state school aid from previous years. The NYSAN is a partnership of 30 after-school providers in New York State. The group issued a statement Saturday expressing disappointment over the final budget decision. The situation is especially regretful, because providers would have been able to quickly put the money to a good use. Over the last two years the state has turned down requests for after-school grants totaling $170 million. There has not been enough money to satisfy the demand. Meanwhile, it is also unclear how big of a chunk of the casino money the city will get, since even bids to establish the casinos are not awarded yet. “We have not said how much of that will go to a given school district,” said Morris Peters, spokesman for the governor’s office budget division. No matter what, de Blasio still seems to be set on expanding after-school as planned. “I think what we can broadly say is, there’s a very substantial commitment, statewide, for after school. … And it’s going to allow us to move forward in the way we’ve envisioned,” de Blasio said.